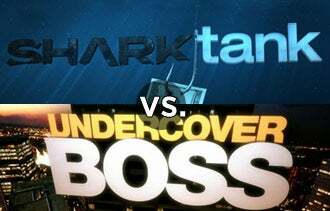 Shark Tank vs Undercover Boss: Which One Helps You Fix Your Business? So it seems network TV producers think business owners have more free time to watch the tube in the winter -- both of the biggest business-related reality shows are premiering within a week of each other. CBS's Undercover Boss kicked off last Sunday, and ABC's Shark Tank is coming up Friday night. I've always thought of Shark Tank as more of a startup-oriented show, while Undercover Boss probably has more useful business lessons for growing businesses. After all, your company has to be a decent size to be able to spy on operations without workers recognizing you, no matter how good your disguise. But that's probably too simplistic. Businesses seek capital and pitch investors at many phases of their development. By the same token, plenty of small-business owners hide in the back office when things aren't going well and let things keep getting worse. Which you watch may also depend on what you enjoy more. On Undercover, you could see Diamond Resorts International CEO Stephen Cloobeck -- whose wife reports he's never so much as changed a light bulb and doesn't own a hammer -- humiliated as he attempts simple handyman tasks such as welding. Part of the fun is seeing what policies the CEO changes after their experience, but you always wonder if those new ideas stick once the cameras depart. Or maybe you'd rather watch entrepreneurs get holes poked in their business models by the likes of Mark Cuban, Barbara Corcoran and Kevin O'Leary -- and take bets on who'll whip out their checkbook. I've been looking over both shows' early episodes and what they have planned, and have to say I'm looking forward to Shark Tank. Another woman investor will pop up this season -- "Queen of QVC" Lori Greiner. The show is also upping its star power with guest appearances by the likes of Apple Computer's co-founder Steve Wozniak and former NBA champ Bill Walton. The Shark Tank feature I'll want a ringside seat for, though, is the show's follow ups. The Sharks have made $9 million in investments in businesses that appeared on the show's first two seasons -- and passed on many entrepreneurs' pitches. The show is promising to revisit both companies the Sharks funded and some they turned down, to see how the story played out. Did the Sharks make the right calls? We'll see who leveraged their Shark connection and made the business explode, who flubbed it and who went out and made a success of it just to spite the Sharks who turned them down. I bet there will be some sharp lessons for businesses of all sizes there. Which show gives you more helpful tips for your business -- Undercover Boss or Shark Tank? Leave a comment and defend your answer.